Note: It looks like the datasheet for this stepper may not be accurate. When connecting this motor to a bi-polar driver you'll want to wire it according to the wiring diagram in the documents below. Get started using the SparkFun Easy Driver for those project that need a little motion. It says NEMA 15...in the description. I think this is a mistake. Shouldn't it be NEMA 17? Anyone know if these will run ok of 24v? With the right driver set up to deliver no more than 400mA per phase, yes you can run these with 24 volts. An Easydriver should do the trick. A lot of people have had questions about torque, direction, speed etc. with these. I've learned from experience that the general answer to this has to do with the current. Be sure there's not too much or too little current; it can generally be adjusted with a little pot on the stepper motor driver, like the EasyDriver. How does one interface this rod with anything else? 5mm coupler? A nut? Is there a nut for this type of thread? I say take it apart and machine the threaded hole to another size and something more common, they weren't thinking when they designed this. I allready ordered myself one of these. Is it possible to take the included shaft out of the motor and insert a regular M5 threaded rod? This would be so brilliant for alot of robot applications when you dont want that coupling between the shaft and the threaded rod. Good luck finding a 5mm threaded rod with a 2mm pitch. Where do you get 2mm pitch? 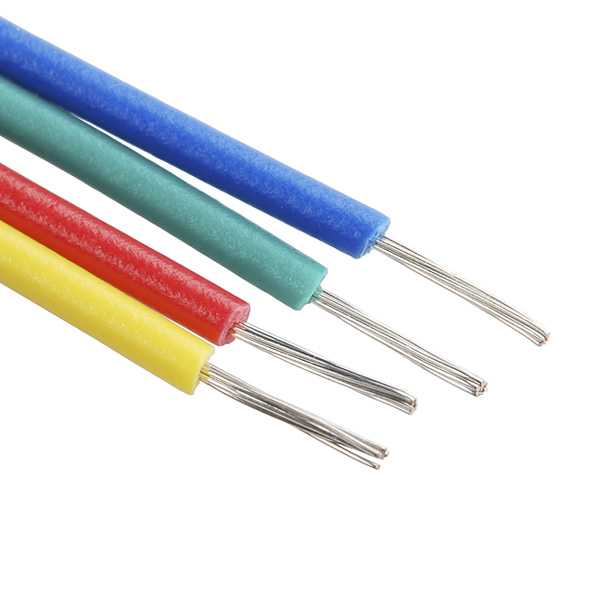 The picture looks like 0.8mm pitch, which is the standard coarse pitch for 5mm rod. Lots of 5x0.8mm rod at McMaster-Carr. The drawing says "M5*2(P1)", which is a little strange. I'm not sure what that is trying to say. But in the picture that sure isn't 2mm thread pitch. Maybe somebody at SparkFun could measure that with a thread gauge? It could be a multi-start threaded rod: a double helix, each of which has a pitch of 1 mm. It's hard to tell from the photo, but it looks plausible. this is used to get faster travel, with less linear force, so 5 revolutions * 1 mm pitch * 2 starts = 10mm. I just got mine, and can confirm that it is a 2-start threaded rod. Hey! Thanks for checking that. Do you have a metric thread gauge? As sethcim says, 1mm pitch would make the math work out. Also, since this is a metric lead screw, I'm assuming it has a trapazoidal thread profile. I've looked around for either rod or a threading die that has two starts at this pitch, but it seems like the standard 5mm multi-start lead screw is 4 start. In theory, of course, one could cut this rod on a lathe... but a long, 5mm diameter, hardened rod is going to be sooooo noodle-y it would take some skill to just cut a single start thread, much less precise multi-start threads. mmmm... maybe... from the side picture it is hard to tell. The picture of the flatted end looks more like single start, but it is hard to tell. The bottom line is that the spec sheet is so sketchy that you can't tell what you are buying when you get one of these. Sparkfun needs to clarify. I think you are correct. If you hold up a straight-edge to the photo, the top and bottom threads crest at the same point, so that would indicate two starts. So I spent some time googling to find a 5mm x 2 dual start trapezoidal threading die.... not much luck. Hmmm.... M52(p1) == 5mm x 2 starts, pitch 1.0 --- suppose? ondrives.com has *four start 5mm lead screws. yep, there's no reason why you couldn't use a longer shaft. you're too kind, really. and you're welcome. just to have 1 rod to be longer? Thanks Robert. I would but... I already can't park any cars in my garage because of tools and workbenches. Besides, the last time I used the 13x40 lathe at the TechShop I threw a 1 pound chunk of aluminum into the chip tray and, um.... haven't yet gotten back on that horse :( That was a scary noise. Using it as a linear actuator, what's the maximum weight a single motor could lift/push? This is a trapezoidal metric thread. Callout on the data sheet is incorrect. Should read Tr5x2(P1), where Tr designates a trapezoidal thread, and 5 is the nominal diameter in millimeters. When there is no suffix, e.g. Tr5x2, it is a single start thread and the value after the multiplication sign is the pitch. If there is a suffix, e.g. Tr5x2(P1), then the value after the multiplication sign is the lead and the value in the parentheses is the pitch. The number of starts is then calculated by dividing the lead by the pitch, in this case 2. First of all, I purchased one, checked it out, and found that the description above is NOT correct. The shaft moves 1cm per 10 full rotations (not 5). The pitch is 1mm. Size 5M (5mm diameter) And (bad news), I could not find 5M 1mm pitch screw anywhere. Not even any tap of that size. 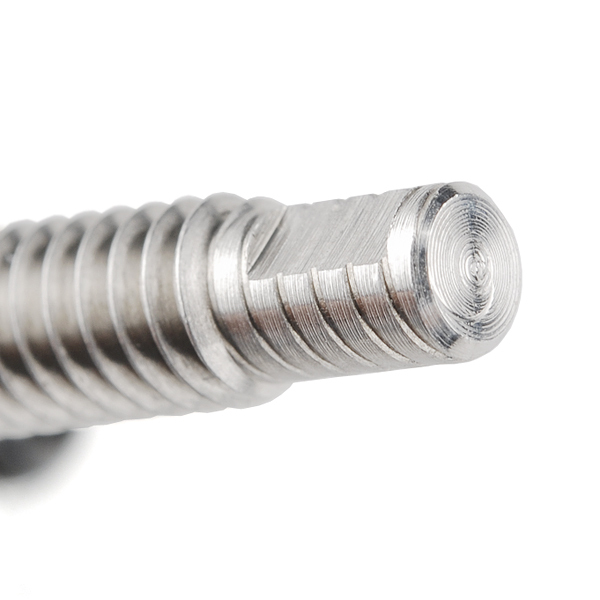 If any of you know any source where you can buy that size screw or tap, please let me know. That will be very helpful. I need this motor with more torque. Anybody know where I can find higher torque steppers with a "thru shaft"? I've ordered 2 of those but the rods need to be longer. http://usautomation.com/VersaDrive17.aspx They have an anti-backlash mechanism and the rods are much longer. Also the motors are better. They work GREAT. I've given some feedback to spakfun, hope they add them to the products. What linear force can the motor produce? That is, If I mounted the motor with the shaft vertical and secured a weight to the bottom end of the shaft, what is the maximum weight I could use before it would stall out? Just got this stepper and it will work perfectly for my project. Stupid newbee question though: I found that if I run it at 5 volts, it is still plenty powerfull enough for what I need to do. Do I risk any damage by using this at 5v instead of 12v? The shaft has a 1mm pitch. It's also stainless steel. That's because it runs through the center of the rotor magnets; if the shaft were made of a magnetic steel, it would become magnetized over time and that's usually a bad thing. In searching for shaft material, I found no source of M5 X 1 stainless threaded rod, though I did find an alleged source of plain steel rod who didn't respond to my inquiries. You can have stainless rod threaded by a machine shop, but it's horrendously expensive. It would be very useful for SparkFun to contact the motor vendor about the price to order custom lengths, perhaps a meter, then let us know how to order shafts from them. My motor is tired of being a paperweight. TDV, do you have any plans of ordering these again? Is the offer for custom shaft orders still available? Wow. Good luck finding a longer rod. I ordered one of these and looked a lot of places trying to find one. Sadly, I even purchased an M5x1.0 die for cutting my own rod, only to discover fully the 2-start problem. A rough estimate from a local machine shop for a custom one came to about 4 hours of work @ $110/hour. This stepper is not worth $450 to me. TL;DR: Get it if 100mm is good for you. Don't get it if you need a longer rod. I have started stocking longer rods for this motor (250mm). If enough interest is shown, I can order even longer sections. These items are expensive, as they are custom made from the factory. 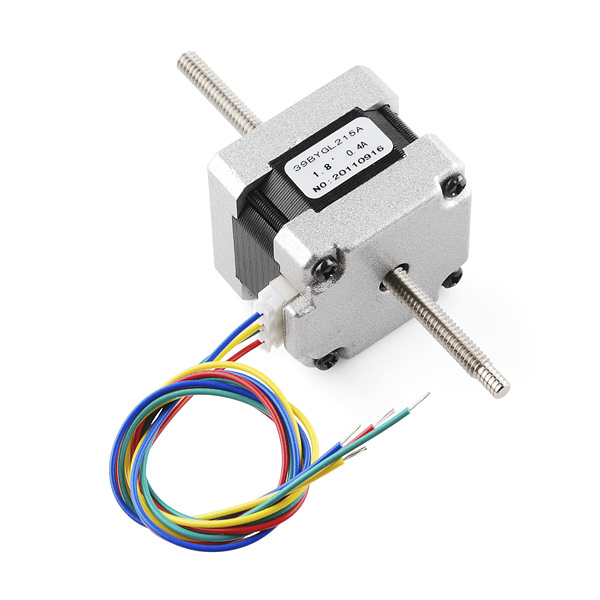 Hey, does anyone know the speed of this stepper motor? Hi, I've got this linear stepper motor and bigeasy driver. I couldnt make this thing turn. When I send step signals It just vibrates. I tried really slow signals as well as faster frequency but no help. The connections seems right as well. what makes this wrong? Do you have enough power? what's your power supply? It seems that the pin outs on the datasheet might be incorrect. You may have to just plug around until it works properly. 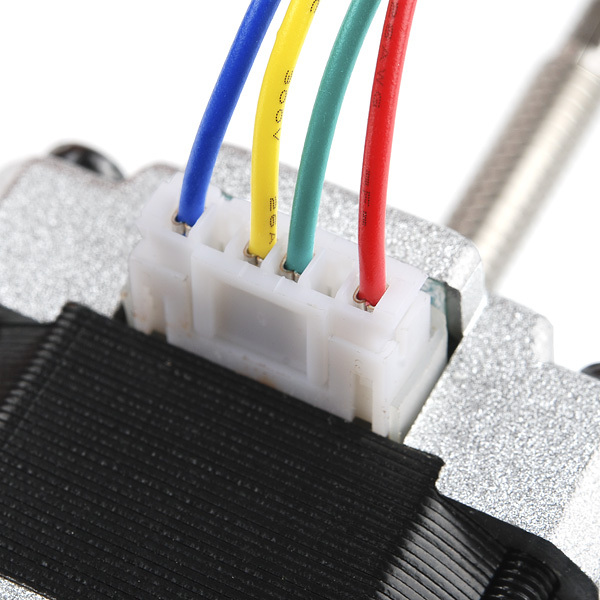 Also, the delay in your code may need adjusting for this stepper motor. If the delay is too short, it just vibrates and does not go anywhere. Been experimenting with driving this stepper. EasyDriver not consistent in both directions. Moves nicely in one direction but just vibrates when reversed. Any other experience with EasyDriver? Used example from bildr to check out. Never found fix. Gave up on stepper motor. Wound up using Bimba pneumatic actuator for application. Good luck. If you find fix please post it. what voltage are you using for the stepper motor? steppers are tricky. Check out this page from Geckodrive, maker of high-end stepper driver boards. Check out the equation for determining optimum voltage to power a stepper. Although steppers have 'ratings' they are oftentimes driven with higher voltage to get maximum torque. The equation is the square root of the inductance, times 32. For this motor, you're looking at over 200 volts! You can easily use a higher voltage supply to get more torque from the motor. That same link has a lot of very useful information about steppers, and driving them. I'm guessing you didn't go look there yourself. Go try it. Go try Small Parts, too. Or Maryland Metrics. Or Misumi USA. Besides, it won't be an acme rod, acme is used for imperial lead screws. 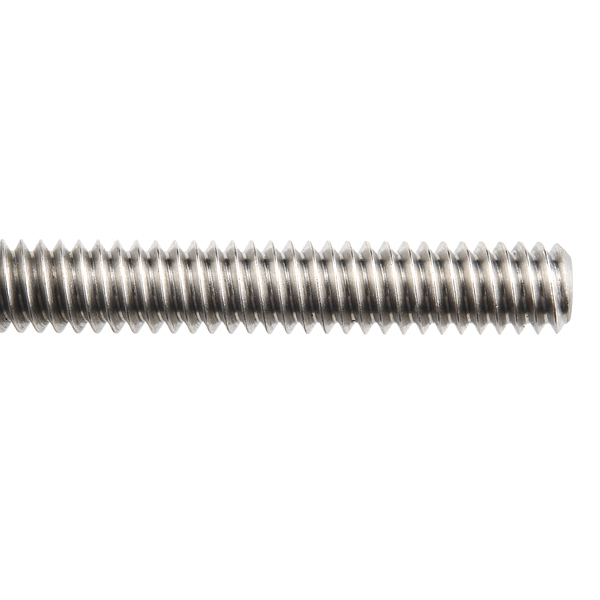 Metric lead screws use trapezoidal thread. How the hell does this sell out after 2 days? This probably tells a little about how much we Sparkfun customers demand more stepper motors and especially motors that makes it easier to interface directly with other elements as rods, and other mechanical things without having to use a coupling. no antibacklash I can see in there, just the one rod that appears to be 2 starts (rod definitely moves faster than a normal thread). Its a bit on the wobbly side. eh well, no. A trapezoid thread is going to perform about like an acme lead screw, which is not bad, but not as precise as a ball screw. If it really is a multi-start rod, then it is probably a trapezoidal thread. I see they are sold out right now -- maybe someone that bought one can measure it for us. I tried this out with a big easy driver, dialed in the current to 400 mA, and it couldn't even consistently move the shaft against gravity, much less move the 5 N load I intended. If I step the motor in one direction, and the shaft moves down relative to the fixed motor housing. Step it in the other direction, the unloaded shaft still moves down. Flip it over, same thing. Turn it horizontal, the shaft may or may not move in either direction. Increasing the driving voltage to the limit of the big easy driver (32 V) and maintaining the current at 400 mA increased the torque slightly, but still nothing near the 29 oz-in rating. We've used these motors in a couple of applications without issue. I'm sorry it didn't work for your needs, however it should be stronger than you described. We used it to build a bed of nails (small scale 1ftx1ft) and the motor pressed the bed without fail. https://www.sparkfun.com/tutorials/356 Feel free to contact us in Tech Support for assistance or a return. The motor functions well and despite the previous reviewer it is quite strong. I wired it to my RPi using the Easy Driver. The problem is that the threaded rod is not a standard size. The spec sheet says it is an M5, but M5 rods are too large (I tried). I tried every standard size rod possible and none of them fit, so if you're planning on swapping it out for something longer, forget about it (or else get one custom made at a machine shop for some serious $$). This is exactly what I was expecting. I dropped a star because it's unclear as to how to connect the wires. Using an ohm meter revealed which colors are which coils. I'm not going to post the colors because I don't know if they are the same for all. btw: getting the connections wrong can result in steps but virtually no torque. A clue can be the stepper moves in only one direction. Another clue may be the current draw is 200mA instead of the more than 500mA.